Complicated hernias often involve contaminating surgical procedures in which the use of polypropylene meshes can be hazardous. Prostheses made of porcine dermal collagen (PDC) have recently been proposed as a means to offset the disadvantages of polypropylene meshes and have since been used in humans for hernia repairs. The aim of our study was to evaluate the safety and efficacy of incisional hernia repair using PDC as a mesh in complicated cases involving contamination. 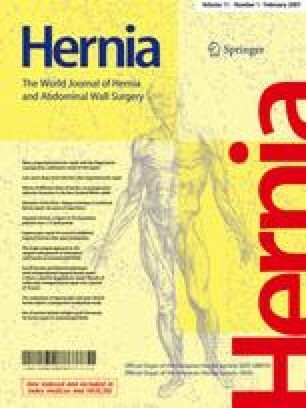 A prospective study of hernia repair of complicated incisional hernias with contamination using PDC grafts was carried out at the Department of General, Emergency and Transplant Surgery of St Orsola-Malpighi University Hospital. From January 2004 up to the writing of this article, seven patients were treated for complicated incisional hernias with a PDC prosthesis. In six out of seven patients a bowel resection was carried out. There were not surgical complications. Morbidity was 14.2%. No recurrences and wound infections were observed. Incisional hernioplasty using PDC grafts is a potentially safe and efficient approach in complicated cases with contamination.